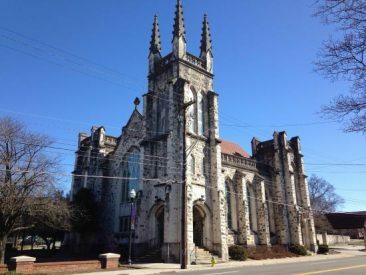 St. John’s Luthern Church in Knoxville TN. Saved from TripAdvisor.com. No Photo Credit present. The WWE starts us off with the usual video package, this time about Kane & Braun Strowman. Roman Reigns starts us off in the ring. He’s ready to defend the IC Championship. The Miz’s music hits but only Bo Dallas & Curtis Axel come out. They are offended by Reigns having the title. They can’t fight back, but Elias Samson can. He offers to become the first challenger. Reigns accepts. Seth Rollins came out as Reigns went back stage. He’s taking on Cesaro. Neither Dean Ambrose nor Sheamus will be around so this will be interesting. A relatively screw job free finish without partner jinks. Booker T is up to his usual hi-jinks on commentary, namely babbling nonsense. It’s about Ambrose & Rollins not getting a re-match despite each member of the Shield having beaten one each of the tag champs. Now that SS is over, you could hot potato the belts back. Cesaro was in control at break one. Rollins was in control at break two. Here’s me complaining about two great wrestlers getting plenty of in ring time. Booker T is now trying to argue that Rollins is going to forget how to be a singles wrestler. Wouldn’t the same problem exist for Cesaro? Even more so really since he never held the World Championship? Cesaro goes for a spring board upper cut. Rollins catches him with a super kick. Rainmaker Knee for the win. How does that not have a name yet? Rollins tells Charley that the Shield is going to stay together. Rollins is invoking the re-match clause for the Raw Tag Titles. Raw gives us a recap of the ‘Zo Train aka Enzo Amore, Drew Gulak, Noam Dar, Ariya Daivari and Tony Nese. (Next Day Note: I meant to verify who the last member of the ‘Zo Train but forgot until now. Just another symptom of inability of the WWE to concentrate on crusier weights.) Cedric Alexander, Rich Swann, Akira Tozawa and Mustafa Ali get to chew scenery while listening to Kurt Angle talk. Really helps them establish a personality. Titus O’Neil and Samoa Joe are having a fun knock down, drag out fight. A straight right staggers Titus. Kokina Clutch for the victory. Apollo Crews trash talks Samoa Joe, tries to attack him then gets a Kokina Clutch for his insubordination. We get a recap of Paige showing up with Mandy Rose & Sonya Deville. Alexa Bliss is on the head set. Sasha Banks comes out for a six woman match. The heels come out. They show that Mickie James & Bayley are injured back stage. Their group name is Absolution. It isn’t going to make them fit in together any better. They’re all doing this for Paige since she did it first. The other women are reaping what she sowed. Oh for crying out loud, they named them that because it rhymes with evolution. Paige, maybe don’t become an allegedly? alcoholic for a year then you wouldn’t need to reclaim this. Just saying. Bray Wyatt still has a lamp he can blow out. I’m just not receptive to his message about not being able to be yourself these days and he couldn’t be any more wrong. There’s a lot different kinds of crazy these days. Wyatt tells us we’re all dead and keeps repeating it. Wow, this is weird and bad. Matt Hardy comes out during this. As that happened, it dawned on me that I haven’t thought about Hardy becoming “Broken” in a while. Sister Abigail for the win. He does the “Delete” thing after this loss. Is this finally the trigger? Jason Jordan wants to dispel the doubters on social media. He wants to take on Kane. Angle makes the match. Akira Tozawa, Rich Swann, Ariya Daivari & Noam Dar are in the first of two four way matches. Swann takes out all three with an over rotated seated senton. Dar & Daivari do a better job of team work to take out Swann & Tozawa. They double suplex Swann on the outside. I like the length of the beat down. Alliances should work together longer in almost all wrestling circumstances. A double superplex backfires on the heels with a Swann power bomb. Dar takes out Swann. Tozawa takes out Dar. Daivari with a frog splash. Swann kicks out at two. Shining Wizard on Daivari by Tozawa. He connects with Top Rope Senton. Dar tosses Tozawa into a post. Dar is ready to take out Tozawa when Swann pulls him out of the ring. Swann switch kicks Dar in the head. Phoenix Splash by Swann for a win. Really enjoyable match. One of the better ones on Raw, I’d wager. It still had too many people involved but that isn’t happening right now. Elias Samson gets to do his set before his match still. He sings a song about The Miz. He is then joined Bo Dallas & Curtis Axel who are are harmonica-ing. I’m getting a good laugh out of this one. Roman Reigns, still mostly a baby face. The WWE won’t be able turn around some of these curmudgeons ever. Samson gets an early upper hand. Booker T trying to convince me that Samson has worked his way up is comical. He had a cup of coffee in NXT then was called up. After his first set, he had more mic time than 75% of the cruiser weight roster. He’s been set up to succeed far better than Jason Jordan. Samson has capitalized on it far better than Baron Corbin. Samson dropped a serious top rope elbow that Reigns kicked out of. Samson with a sit down power bomb that gets kicked out of too. Samson gets frustrated. Superman Punch out of nowhere gets a two count. Samson wards off one spear attempt. Reigns connects quickly with another attempt for the win. Reigns celebrates his victory on his way to the back. Samoa Joe comes out and locks on the Kokina Clutch. Glad we’ve already seen the end of the Reigns open challenge era has already closed. Asuka is taking on Dana Brooke. Dana says that Asuka is a slow starter in an inset promo. Brooke charges at Asuka who flips her into an arm bar for the tap out victory. Paige comes out with Absolution. They step away from the ring. Asuka retreats with eyes on them. Interesting. Jason Jordan is doing a great job of basically repackaging Kurt Angle’s gimmick. Corey Graves reads my mind and compares Jordan & Samson. Booker replies that Samson earned it.